I love cruises. I hate days spent “at sea” but if the itinerary suits me. cruises are great. Oh what the heck, any itinerary suits me. After years of renting cars or driving our own cross country, Doc and I decided maybe it was time to let someone else do the driving. We’d taken a couple of cruises previously so we had an idea of what to expect. And logically, it sounded like a great idea. We could see the Mediterranean without living out of a suitcase — Without having to move luggage from city to city, up and down elevators or worse, stairs! every couple of days — Without spending all of those precious daylight hours traveling to the next destination. We’d travel all night while sleeping and wake up each morning in a new port waiting to be explored. We’d unpack one time, push our empty suitcases under the bed and have a “home” to return to each night. A cruise ship is a floating hotel and transportation all rolled into one! 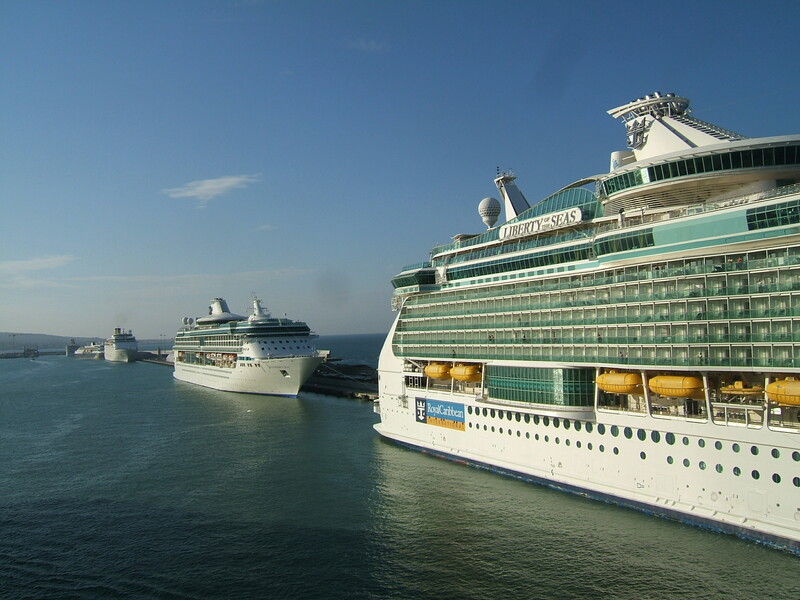 What surprised me was finding out how passionate regular “cruisers” are about everything “cruise.” I started browsing the travel forums to find out if there was anything I might be missing that I should know. I wondered if there was anything special I would need to pack. What I found were knowledgeable, experienced cruisers who pack multiple suitcases with everything from shorts to formal wear and just as many who board a ship for two weeks with nothing but a backpack. Both swear by their method. Both make good points about why they packed so much or so little. But I knew that I wasn’t going to land in either of those camps. Even though my airline perks allow me to check two bags per person for free, traveling with that much luggage would be unpleasant and impossible. But neither was I willing to go the backpack route and do laundry in the sink or wear the same pair of shoes for 12 days. No way. Doc and I already had a set travel packing routine and we’d stick with it. We’d have two checked bags and we’d pack each one with half of my clothes and half of his. If the airline were to ever lose a bag we’d both still have something to wear. We’d take one small carry-on between us plus my crossbody day pack. If something didn’t fit, it would just have to stay home! Packing for 12 days in one suitcase is difficult enough but packing for a 12 day cruise seemed impossible! I was hoping not only to fit in everything I needed, but also have room left to bring home a few souvenirs on the return trip. The first thing to be put into the “stay home” category was the formal attire. No sweat over that. Doc and I are long past the days of wanting to dress to the nines anyway. Plus, it was to be a port intensive cruise and I knew we’d be very tired at dinnertime. Formal night on the ship would have to happen without us. As luck would have it, we were sailing Norwegian, a “freestyle” line and the closet thing they would have to a formal night is called “Dress up or not” night. Our everyday khaki pants with a nice blouse or a polo shirt for Doc would suffice. If our ship had done formal night, however, it wouldn’t have changed our packing plan. We simply would have eaten in one of the “non formal” venues or stayed in our room and ordered room service that evening. If you want to dress up, I would suggest taking only one outfit. No one is going to notice that you wore the same dress at last week’s formal night and even if they do, they won’t care. You’ll be in good company. Experienced cruisers re-wear their clothing. There is a laundry service on ships. Twice during our cruise we could fill a laundry bag for a discounted price. By using it just once, it meant we really only needed to pack for one week instead of two. Even so, we could have gotten away with taking even fewer clothes than we did. If throwing something extra in the suitcase though will make me feel better, I go ahead and throw it in. As long as it fits in the suitcase, it isn’t an issue. 7 daytime bottoms — I took a mix of Dockers and Capris; Doc a mix of Dockers and shorts. 1 pair dress slacks — our daytime Dockers (and tops) were fine for dinner on most nights. 1 white or black sweater — good for cold mornings but also nice enough to wear in the dining rooms. 12 days worth of undergarments plus 6 extra –you can get away with fewer if you launder them but I don’t like to. 1 bathing suit — If you swim everyday take two. A swimsuit won’t dry overnight. 2 pair of walking shoes — Our trip was port intensive and even shoes that you’ve worn before and know are comfortable can make blisters if you walk in them too much. Two pair of shoes allow me to switch them out from day to day keeping my feet more comfortable and trouble free. Nothing can ruin a vacation like getting a foot blister. Shoes are heavy but in this case, it is well worth the added luggage weight. 7 pair socks plus 2 extra — I wear either a double layer sock designed for hiking or a sock with a sock liner. The double layer means that the sock layers rub against each other instead of your foot and reduces the possibility for blisters. 7 pair of white “ankle” socks — I wear them around the room/house whether or not I’m traveling. 1 pair sandals ~ Mine are basic white. I wore these around the ship during the day and then to dinner at night. I also took a pair of heels to wear at dinner but ended up wearing them only once. After walking around ports all day, my feet were tired and my white sandals were more comfortable and they looked nice enough for the dining room. I could have left the heels at home and saved the luggage weight. scarves — a couple to dress things up a bit or to cover my head when it’s required at religious sites. I pack trial sizes or the smallest sizes I can find. This bag goes right into the bottom of my checked suitcase. blister kit — you can get this at a sporting goods store. It has felt pads you can use on your feet if you develop a blister or on a sore spot to prevent a blister. The moleskin pads stick much better than bandaids. There are going to be some non-clothing items that you’ll want to have on your cruise. I pack all these together in my carry-on. This looks like a long list but everything is small! jewelry — I put on jewelry before leaving the house and I wear the same thing everyday. I don’t take any extra jewelry. But if you do, don’t pack it or other valuables into your checked luggage. over the counter medications — you can’t buy these in the ship’s store. I include: Imodium, Dayquil tablets, trial sized aspirin, trial sized ibuprofen, Neosporin ointment, roll of Tums, alka seltzer, Bandaids, and tweezers. They go in the carry-on instead of the toiletry bag in case we need it on the plane. cell phone and charger — using your cell phone on the ship will likely be impossible or else very expensive. We use our cell phones in ports only. netbook — this has its own carrying case but I pack the whole thing, case and all, onto the top of my carry-on so that I don’t have to carry it separately. You have to remove it before going through airport security and run it through the x-ray machine separately. GPS — It’s another small item that doesn’t take much space and the pedestrian mode is handy to have in strange cities. Make sure you have maps installed for the cities you will be visiting though. You’ll also need a battery charger if your GPS didn’t come with one and buying the charger seperately might cost more than it’s worth. large trash bags — for bringing home dirty laundry. I also bought a fold-up laundry hamper at the dollar store for $3 that fit right into our cruise cabin closet. Hanging organizer — there was no place in our cabin to store extra things like batteries, chargers, pens, etc. Our nightstand was no bigger than the phone it held. Our desk was small with half of it taken up with the coffee pot and we wanted the other half for setting up our computer. My hanging organizer came with my luggage and is a simple bag with zippered pockets. Some cruisers use hanging shoe bags.